The Fox Foundation has been very fortunate to have excellent industry partners who help us find affordable opportunities to present inspiring workshops and master classes of show choreography and music, taught by the professionals to local students. In FY17-18, the Fox Foundation – in conjunction with Broadway Show operator American Theater Guild (formerly known as Theater League) – was able to hire professionals from the Broadway tours of Dirty Dancing, and A Chorus Line. 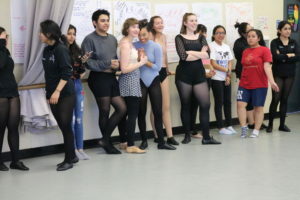 The Dance Captain of Dirty Dancing happened to be an alumni of Ramona High School – so we brought her to her former stomping grounds to teach up-and-coming aspiring performers the famous closing dance sequence of the show! It was a smash success. 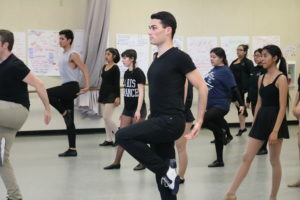 Most recently, two members of the cast of A Chorus Line joined us, and back to Ramona High School we went! 45 students joined A Chorus Line master class, to learn the opening and closing sequences of that show. You can check out the full story here. Suffice it to say, it was a special treat for the group, who arrived at the Fox a few hours later to watch the gentlemen perform – and cheer on their mentors!